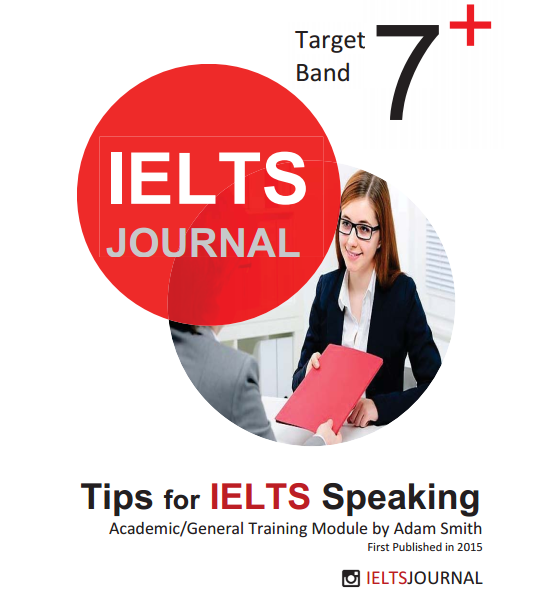 Tips for IELTS Speaking for Academic/General Training Module is an essential book for IELTS learners to score Band 7.0+ in the IELTS Speaking Module. The IELTS Speaking Test is the final part of the exam. Your test will usually be at some time between 1.30pm and 5.00pm. You can take only your ID document into the exam room. The test lasts between 11 and 14 minutes. You will be interviewed by an examiner who will record your conversation. Timing is strictly controlled by the examiner, so do not be surprised if he or she interrupts you during an answer. We can predict the kinds of questions that the examiner will ask. We will prepare ideas, possible answers and good vocabulary for each part of the test. Which part is the most important? Do the 3 parts of the speaking test carry equal weighting when your score is calculated, or is one part more important? – Part 1 is supposed to be quite easy (like a warm-up), so you won’t get a high score if you only do well in this part. – Part 2 is when the examiner really gets a chance to assess how good you are. He/she will now have an idea of what scores to give you. – During part 3, the examiner is making his/her final decision. A good performance here can boost your score. What should you do if you don’t understand a question in the speaking test? Many people agree that the secret of success in the Speaking test is being confident and creative person. Does it mean that others will fail? Not at all! This test is PREDICTABLE. Use the following tips to prepare yourself to what’s coming and the confidence will come. If you know what is important to IELTS examiners, it improves your chances of success. These guidelines refer to every part of the Speaking test. Stick to them and you will satisfy your examiner. • Understand what the examiner asks you and confirm that by answering accordingly. • Demonstrate how many “smart” words you know. • Use all the tenses when you speak – past, present, future – and use them correctly. • Pronounce the words correctly. For example the word “culture” should sound like “kolcher”, not “kultur”. • Important! Accent has nothing to do with pronunciation, so it will not affect your score. This tip refers to the whole Speaking test. Don’t start long and complicated sentences if you don’t know how to finish them! Keep your sentences simple, and words – understandable. If you make grammatical error – it’s ok to correct yourself, but don’t overdo it, you must sound fluent. When you hear a question, your mind automatically draws an image with the answer. You can describe this image in your own language, but when you start to describe it in English, suddenly you don’t have enough words in your vocabulary. So try to think of what part of that image you can describe, do it and stop there. Don’t let yourself show what words you don’t know by saying incomplete sentences.